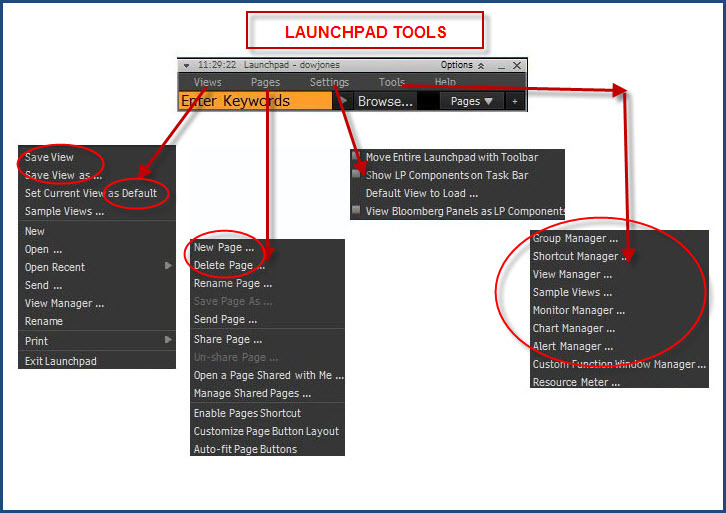 Bloomberg Launchpad BLP <GO> is a tool used to personalize your Bloomberg desktop. A Launchpad View will look something like this, depending on which Components you select. Use this tool to help you keep up on all of the securities and industries you are currently tracking. The Launchpad can contain a watch list of securities, news, analysis or whatever else you want displayed. You can save this customized View (create as many as you need) and use it over and over. You can also change a View whenever you want. Just be sure to save your changes. 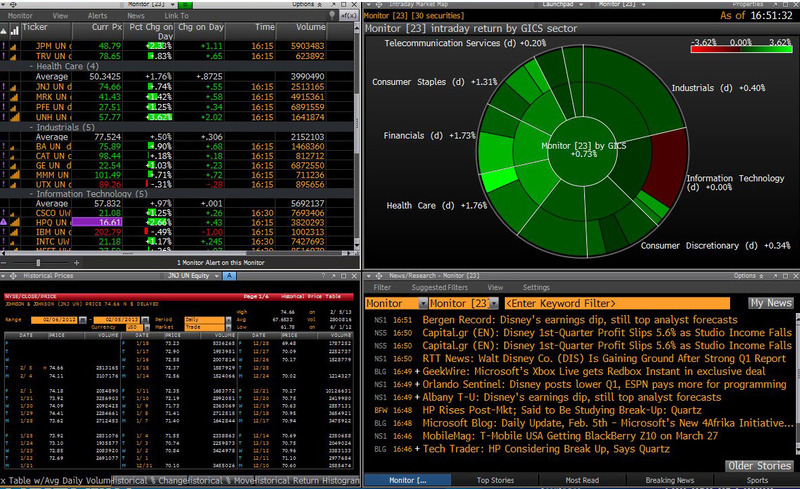 And, you can select which Launchpad View displays when you log into Bloomberg. Monitor: A watch list of securities. Components: Boxes displaying different functions related to the Monitor or a security. View: A combination of Components which display on the desktop. Views must be named and saved. Groups: Components that are grouped together. In a Group, if you change something in one Component it is reflected in the other Components. The Launchpad includes several tools that are helpful for creating and managing your Launchpad View. Several are described below. Views: Use this function to save your View, which displays the set of Components you have created and the way you have customized them. Any time you change any Component, you need to save the View. Pages: At times you may have so many components in a View that you will want to create Pages. Click on New Page to begin. Give the page a name. The new page will literally look like a blank screen until you add components. 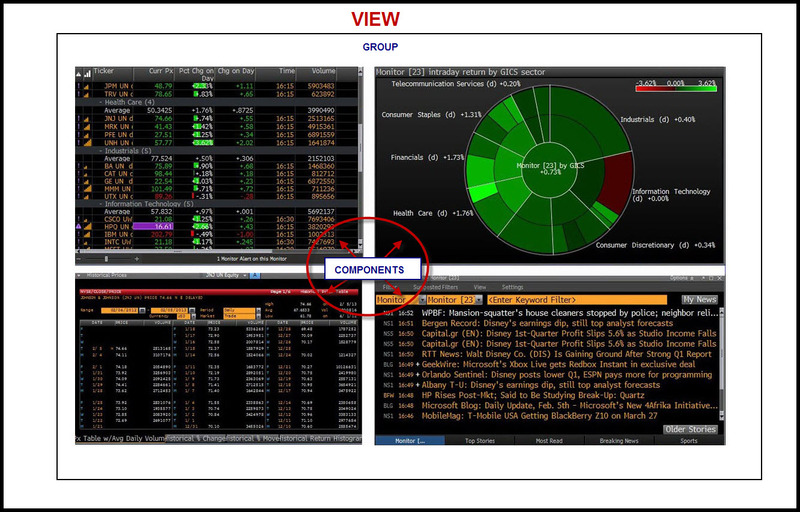 Tools: The options included in the Tools tab allow you to manage your various Monitors, Views, and Groups. Use the Managers to save them, create new ones, rename them or delete them. Notice the tabs available such as Create New, Launch, or Delete. Now that you’ve seen the basic structure of Launchpad you are ready to begin building your own. In a future post we will show step-by-step how to create a new Launchpad. In the meantime take a look at our Bloomberg Help Guide and Bloomberg Highlights Round 1, Round 2, and Round 3 for general information about using Bloomberg. This entry was posted in Bloomberg and tagged Bloomberg, Launchpad by Cynthia Cronin-Kardon. Bookmark the permalink.